Portsmouth, VA – April 13, 2016 Fairlead Integrated was awarded the Sustainment Pavement Repair (SuPR) Kits contract by Graybar, on behalf of the United States Air Force. The contract consists of building 25 kits, with a period of performance of one year. 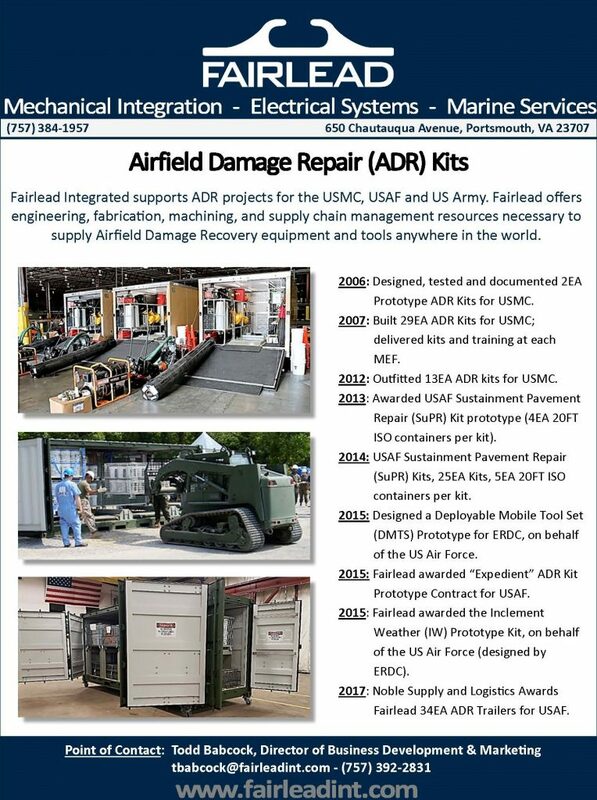 Each kit consists of five, 20ft ISO containers, with the objective to provide suitable repair equipment & materials for airfield sustainment-level repairs. The SuPR kit provides necessary tools to fix Asphalt Concrete (AC) and Portland Cement Concrete (PCC) pavements rapidly, as well as full-depth crater patches, partial depth spall repairs, partial depth patches, and full-depth patches in pavement. All items and equipment will be integrated into the containers while still offering convenient storage and retrieval, as well as the ability for planned Re-capitalization. When combined with trained engineers, the SuPR Kit provides the USAF the ability to make rapid durable airfield pavement repairs in order to continue air operations, within two to eight hours. Fairlead Integrated gained intricate experience by developing the first SuPR Kit prototype, which initially consisted of four 20-foot ISO containers but later increased to five. Fairlead’s engineers seamlessly fit more than 350 individual items of materials and equipment in one comprehensive package, which included two ISO containers configured for consumable materials, while the remaining ISO containers housed equipment, tools, and maintenance supplies. If you would like more information about this topic, please contact Todd Babcock at (757) 392-2831 or email tbabcock@fairleadint.com.